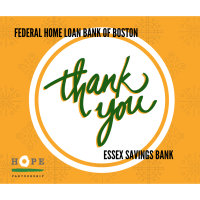 HOPE Partnership, Inc. is thrilled to announce a total of $1.4 million in financing for our Spencer’s Corner project in Centerbrook from the Federal Home Loan Bank of Boston Affordable Housing Program (AHP) and Essex Savings Bank. The financing is comprised of a $500,000 direct subsidy and $900,000 Capital Advance to provide both construction and permanent financing for the conversion of the second and third floors of the Spencer’s Corner property into 17 units of affordable housing. The Capital Advance is a loan which includes $200,339 to subsidize the interest rate. Construction is expected to begin later this year. HOPE Partnership is a non-profit organization dedicated to developing affordable workforce housing opportunities in Southern Middlesex County. HOPE’s philosophy is to collaborate with town government, builders, and other private partners to build housing that is attractive, sustainable and appropriate to the surrounding neighborhood. The CFMC grant will be used to train HOPE staff to act as an administrator for approved affordable housing developments throughout the shoreline area; both for HOPE projects as well as third party projects. The Affordable Housing Program (AHP) allows the Federal Home Loan Bank of Boston to address, in partnership with member institutions, affordable-housing needs primarily in communities across New England. A portion of the Bank's net earnings funds the program, which awards grants and low-interest advances, or loans, through member institutions.